It’s been a crazy couple of months since the closing on the little cottage. Still letting it sink it. Not one to usually rush decorating and furnishing projects, but since I wanted to be up and running for summer the clock is ticking… The good news is that the ‘cottage look’ lends itself perfectly to painted furniture. 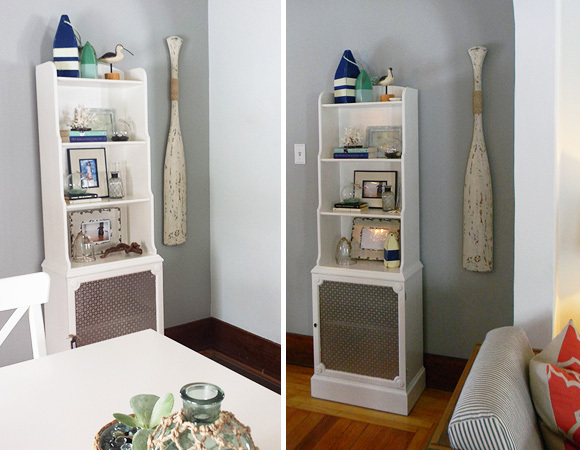 So have been getting my DIY on and collecting pieces from Salvation Army and digging out my storage unit for pieces that would look great with a white-painted facelift. I am pretty relaxed about this whole process. If my perfecting personality can roll with this process I figured it was worth sharing. There are tons of blogs devoted to which paints to use, and they probably know much more than I do. I hope the painting police don’t judge what’s wrong here. If I were truly restoring some heirloom piece things might be different…but we are talking about furniture abandoned in the garage so no judging. THE RIGHT TEMP – Paint doesn’t like the cold or hot. It will act sticky and funny. If it’s a frigid winter day or a hot summer one and you can’t paint on the deck or in the garage, grab an old sheet and plop down somewhere in the house. SCRATCH IT UP – Use sandpaper. I hate this part, am lazy and don’t do a perfect job. But do it at least a little and then wipe it down with a wet paper towel to get the dust off. You will especially need to scratch it up if it has laminate on it. THE EXCEPTION: Some types of wood will actually bleed. You will swear you painted it white, leave the room and come back to it looking yellow (this has made me insane before!) In those cases, I have heard if there is a decent shine on the piece already (a decent coat of polyurethane) it would probably be best to leave it on as it will act as a blocker a bit. Clearly you would not have known this unless you tested a bit, so more boring steps if you feel like it testing out a little spot. PRIMING – Lots of lessons learned here. If you are going to distress your piece you can probably skip this part but I tend not to distress my pieces so always prime. 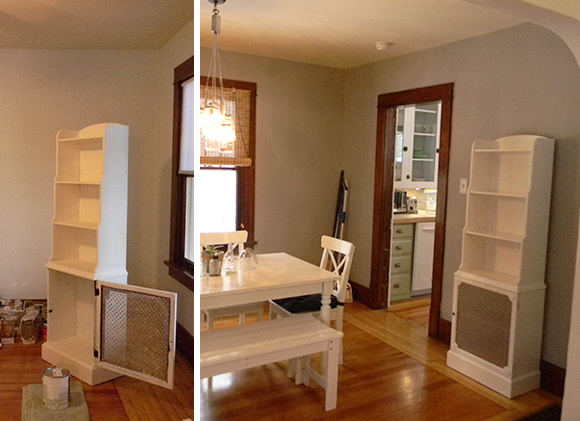 I used to cheat and use any undercoats laying around …leftover wall paint, sample whites, flat, primers, etc. Sometimes I still do if I know the wood is safe…but due to the bleeding issue above it is best to use a stain-blocking primer like Kilz. The more coats the better. Try to keep it from getting gloppy and heavy anywhere since bumps and drips will show through. But you don’t have to worry about the color being completely covered here. FINAL COAT TOOLS – I use a combination of brush and roller for my last coats. Some cracks you will just need to get into with the brush, but afterwards try to roll over them, and for the smooth portions, like the top f a table, definitely use a roller. High density sponge rollers will go on nice and smoothly. 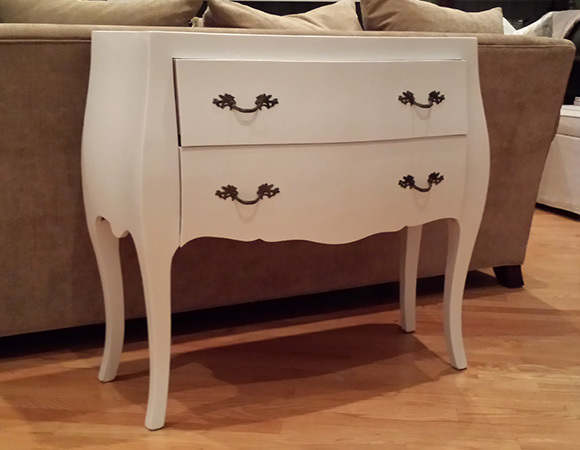 FINAL COAT PAINTS – In the past I used white latex paint for my final coats. (Even leftover house semigloss – again am sure a mortal sin) Latex means shiny. I loved how it morphed out as you painted, making your stroke marks vanish. It was also easy to wipe off minor smudges that might happen as people scuff it up. I have lots of pieces that way and frankly they are still looking good. BUT the more proper way I have learned is an water-based enamel paint. If you walk by the latex paint even weeks later you can still squish your nail into it a little bit. Make sense? Whereas enamel paint will make it HARD. With either of these, let them fully dry in between coats, just like painting your toes. 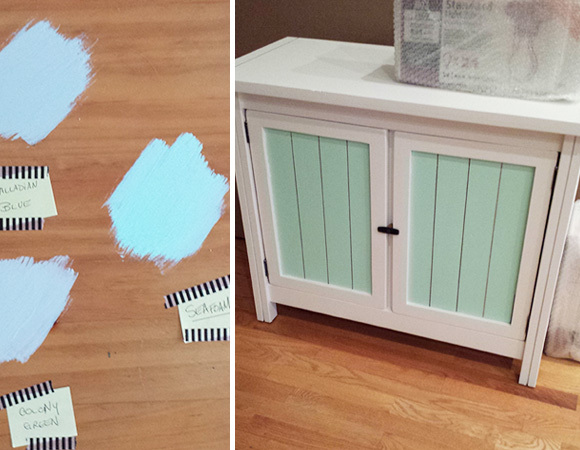 CHALK PAINT – Ironically I have chosen to go the gloss route with all of the pieces I have painted for the cottage. But if you want a flat look (and want to be more proper than using leftover flat wall paint, eh-em), chalk paint is supposed to be neat to work with. 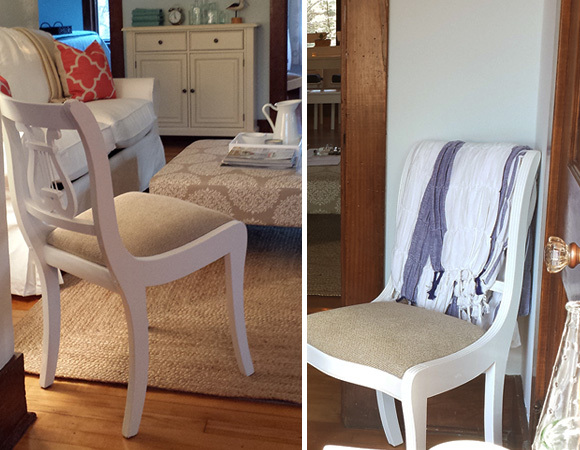 It distresses well and is good for that cottage worn look. Remember it will be dulled so marks or scuffs will not dab off as easily – so consider the wear and tear on the piece and it’s location. POLY FINISH – If you want a real glossy finish at the end you can paint on a coat of Poly. Minwax Water Based Polycrylic in satin or gloss is one I have used. More lesson learned. Poly likes to be stirred NOT shaken (you don’t want bubbles!) I have better luck with a bristle brush then foam, and go with the grain. Lastly, it will look milky going on, don’t panic, it will dry clear! Now for the fun before an afters! 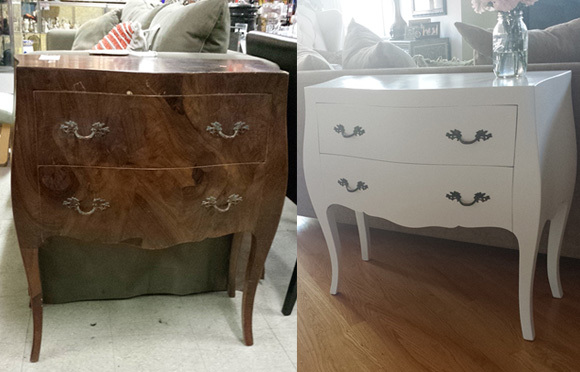 Here’s what gone up to the cottage so far…Found this little Bombe chest sitting at Salvation Army for $60 and just had to bring her home. 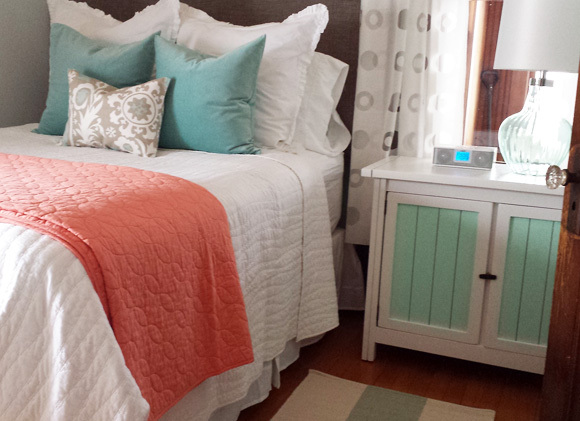 I think she is much more suited for a cottage bedroom in white. Especially love her curvy legs. 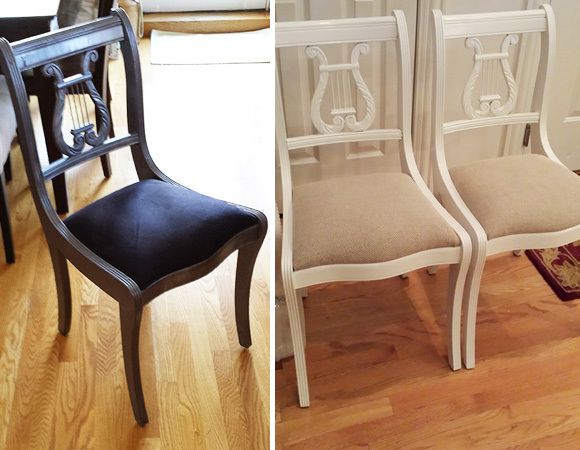 These two chairs were from an estate sale years ago. The strange grey sparkly paint and black velvet cushions never went with my condo so they’ve been sitting in the garage for years. The harp was no fun to paint, but once I finished and replaced the cushion fabric with a neutral leftovers it was worth it. Not sure where they will permanently live in the cottage yet but extra seating is always nice. 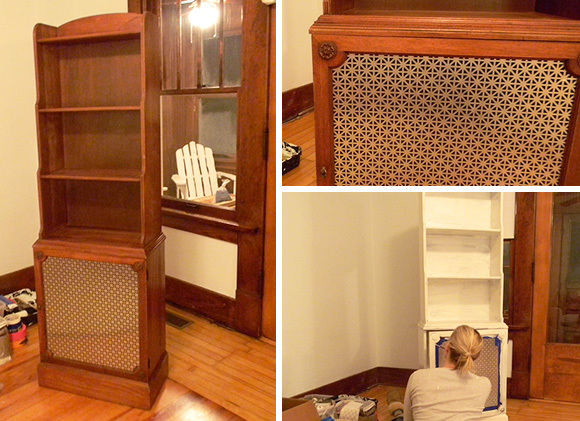 I had a little fun with this blonde wood cabinet – tested some fun colors on it’s top before painting it. After it was all painted white, I got gutsy and used Benjamin Moore ‘Seafoam’ on the doors ~ a look I could never do in my city condo so why not! 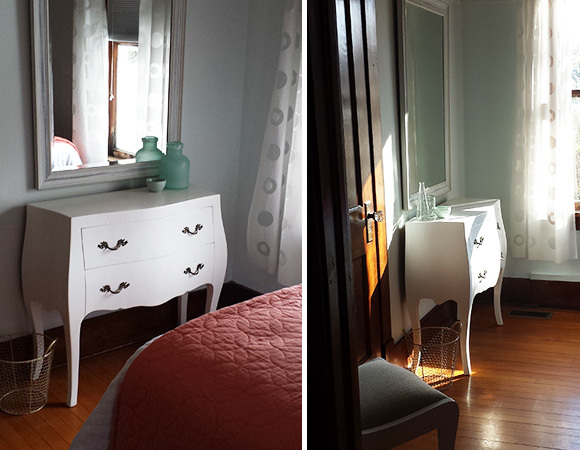 It is now a nightstand in one of the bedrooms. Note, I went flat paint on this and regretted it a bit – again just scuffs up more easily. This Salvation Army bookshelf was an example of the yellowing that I described above when wood bleeds. ARG. Used a stain-blocker primer after I realized it and many white coats after. 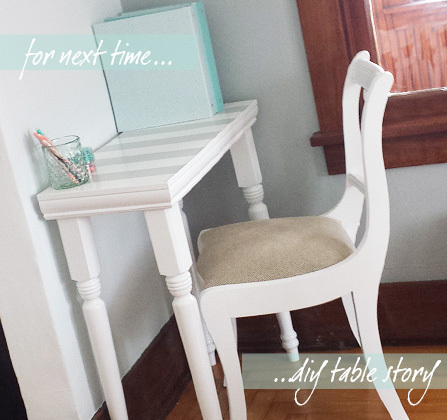 Finally this little diy desk disaster…will post the story later! But for the record used a couple of coats of Poly afterwards to seal in my grey stripes. It worked well. These other ladies know much more than I and have great tips as well!